what is the best HID light spectrum? I've seen 5k-12k for sale and not sure which is best. some friends have suggested that 6k is the best, but what do you think? 35W 4300K has the most visible light output. 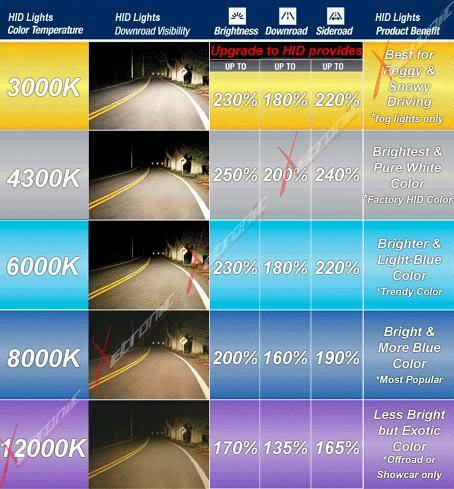 what is the best HID light spectrum? It depends on whether you want pure white or annoying blue/purple. that chart you posted is a lot better then some of the others I have seen. thanks. My 35W 4300K is much brighter than my neighbor's 5000K. 4300K will ALWAYS output more light than the other comparable wattage bulb temps. All the other "temps" use a filter to adjust the light output (block/filter wavelengths) and get the desired color. Not to mention the higher up the spectrum, the harder it is on your night vision as blue light kills night vision and blinds other drivers. This is the 35W 6000K kit from DDM tuning. I LOVE the color and light output. A lot closer to pure white than that chart depicts. Only has a very small tinge of blue. They are so stinkin bright, I can't even imagine a 55w kit. Quick Reply: HID lighting quality?